India, with its emerging economy and vast population, is becoming an attractive market for news organizations looking to grow their international audience. The Huffington Post joined a growing number of outlets expanding into the country when it recently announced partnering with The Times of India to launch HuffPost India in November. While India has had a strong newspaper market, the country’s digital penetration lags behind that of other countries. Just 13% of Indians went online in 2012, according to International Telecommunication Union. A recent Pew Research survey found only 8% of Indians with cell phones use them to access political news. News companies are betting on speedy growth in the digital market to replicate that of newspapers, given the potential for growth as more in India go online. Internet adoption in India is up — about three-fourths of the population own cell phones, and the country recently surpassed 100 million active Facebook users. 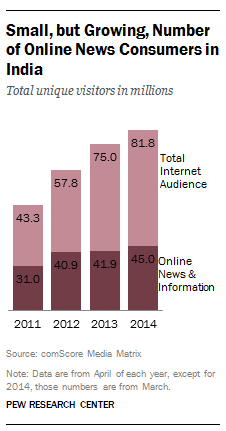 Online news consumption is also increasing. India’s unique visitors to online news and information sites grew from 31 million in 2011 to 45 million in 2014, an increase of 45%, according to an analysis by comScore. And the government is actively trying to accelerate India’s move toward embracing digital technology. In the 2014 State of the News Media report, Pew Research Center examined the growth in digital news and found that many organizations are investing in global reporting — an area that has seen major cutbacks in recent years. 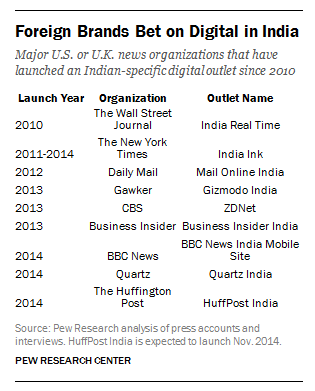 Since 2010, nine major outlets from the U.S. or UK have launched or will launch a digital outlet in India. BBC News, which has long been an established brand in India, introduced a mobile news site in April to coincide with the political elections. Quartz, a digital publication owned by Atlantic Media, debuted Quartz India in June. Quartz Publisher Jay Lauf cited India’s growing middle class, the country’s appetite for business journalism and the potential for large scale digital and mobile growth as reasons for launching in India. “By establishing our brand now,” Lauf said, “imagine where we’ll be in five years”. Business Insider India debuted in 2013, as did Indian-specific sites from Gizmodo and CBS-owned ZDNet. The British newspaper, Daily Mail, introduced Mail Online India in 2012, and blogs from The New York Times and The Wall Street Journal debuted in 2011 and 2010, respectively. (The New York Times subsequently shut down many of its blogs, including India Ink in July 2014). And three digital-only companies have India on the radar. Vice News is in the early phases of establishing an operation in India, Global Post has reporting resources there and BuzzFeed has plans to expand there by the end of 2014.